As far as New York City parks go, Brooklyn Bridge Park isn’t one where wide expanses of green space are given precedence over public structures—the park’s refurbished piers hold all manner of activities, from beach volleyball to a carousel. 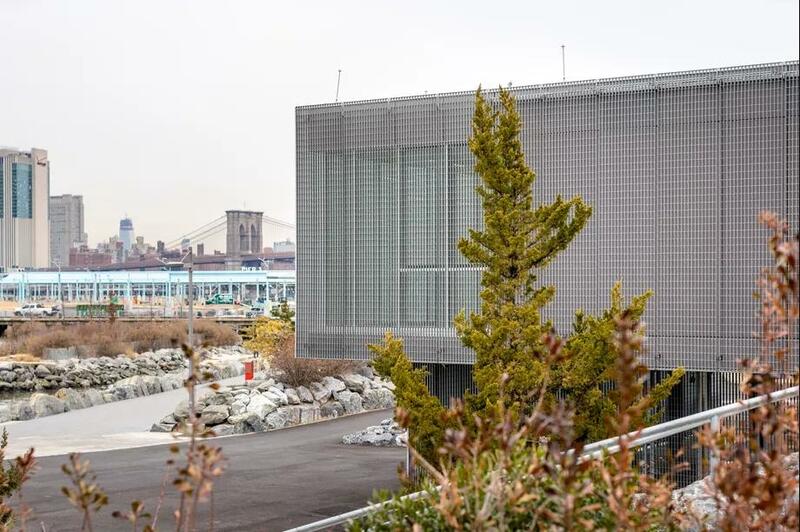 Even still, the latest addition to the park may seem curious to some; a small metal box is tucked into the landscape, perched atop pile of riprap at Pier 5, near the park’s southern tip. This structure, designed by Architecture Research Office, is the park’s new boathouse, which is due to make its official debut this spring. When the boathouse opens, it will serve several purposes: storage for the boating organizations that launch from the park, space for those organizations to hold classes or workshops, and to become “a main point of guest interaction,” according to Landau—BBP employees will be stationed there to provide information to parkgoers. And it comes with another crucial, much-needed amenity: public restrooms. “You can never have enough in the park,” says Landau with a laugh. When it came to designing the building, ARO knew that they didn’t want the architecture to become too cluttered—especially considering that the building overlooks a postcard-perfect view of lower Manhattan. “We knew we were designing a simple community room with the best view in the world,” explains Stephen Cassell, one of the firm’s principals. The design also needed to conform to the park’s larger mission of sustainability, while respecting and interacting with the terrain created by Michael Van Valkenburgh Associates, the firm responsible for the park’s landscape. 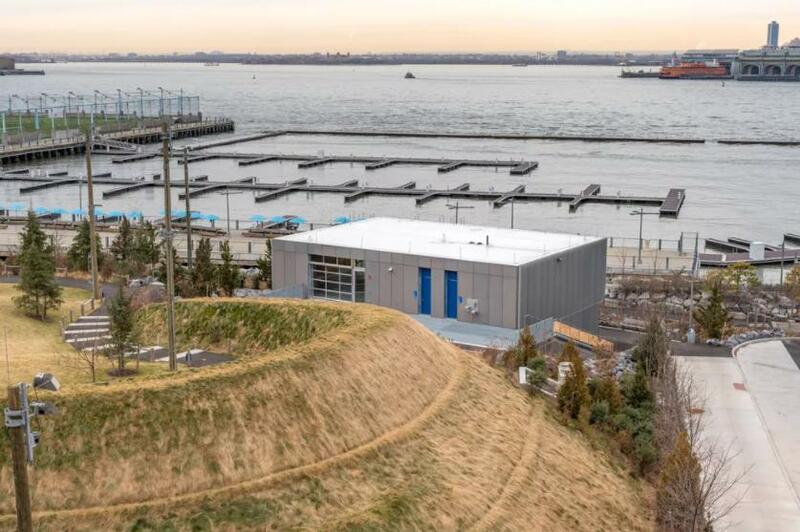 Pier 5’s defining feature is a noise-dampening berm, built to keep out the roar of the nearby BQE, and the boathouse is sized to take full advantage of those muffling qualities. And then there’s the most obvious challenge: the water itself. The boathouse sits squarely within a flood zone, which could have been a problem for public programs and other events at the boathouse. ARO’s solution: “We realized we could rise the public programs up, and create the boat storage below,” Cassell explains. 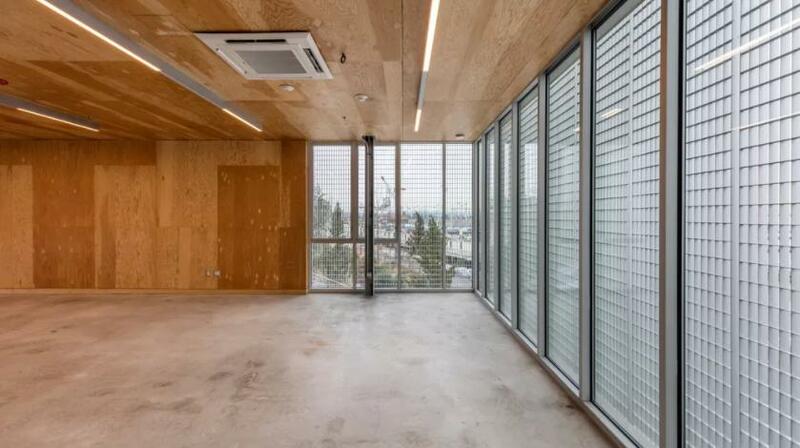 Now, an open, multifunctional room is perched atop a wide, open expanse below, which is enclosed with gates made from the same aluminum grating as the rest of the building. Those will be open in the summer and when boating groups are taking their vessels (mainly kayaks and other non-motorized craft) in and out of the building, but can be locked for safety at other times. Head up a flight of stairs next to the building, and you’ll be at the entrance to the boathouse, which is also where those all-important bathrooms are located. The room above is, essentially, a large box that can be transformed as needed, with little ornamentation or clutter. ARO used simple materials for this space: aluminum grating on the outside of the structure, concrete slabs for foundation, and plywood on the interior to give the whole thing a warmer feel. “There’s a long history of boathouses that have simple plywood sheeting,” notes Cassell. The sparseness of the room ensures the view is the main attraction, and also helped achieve the goal of sustainability. “It’s such a simple building that it didn’t take extreme measures to make it energy efficient,” says Cassell. When the boathouse opens in just a few months, Landau, the park president, believe that it will fill a need for a “very public, forward-facing building” within the park. “Being on the water and having a connection to the water was a big piece of the park’s original design and intent,” explains Landau. Thanks to the new boathouse, that intent is closer to being fully realized.